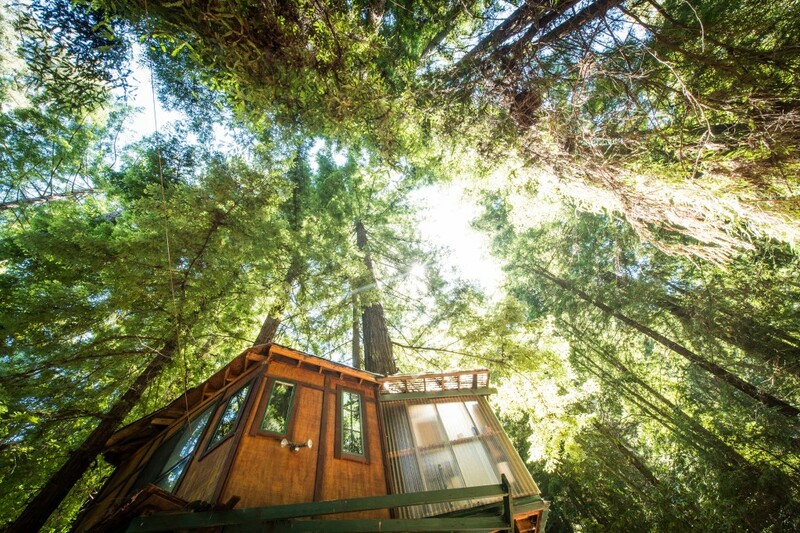 This tree house gives glampers a totally new perspective and a very memorable experience. Image courtesy of GlampingHub. Glamping. It seems that most people know what it is– ‘glamorous camping,’ but few have actually done it. Yet it’s a great way to experience the great outdoors without hauling around a bunch of camping gear. And anyone who’s pitched a tent knows what a comedy of errors that can become! Although we may be nearing the end of summer, one of the fun things about glamping is that you can find everything from a safari tent to a rustic cabin. As the weather begins to cool, look for a place with a potbelly stove or fireplace to keep you cozy warm. Some rentals have small kitchens or even come with breakfast or room service delivered at your request so you can leave your cooking gear at home. Unique and sometimes wildly quirky, even if you’re just an armchair traveler, you should visit Glamping Hub’s website. There you’ll find everything from a cave in Spain to a thatched-roof hut with an ocean view on the coast of Baja. The photos alone will have you dreaming up adventures around the globe. The views from these beautiful tent cabins are stunning. Image courtesy of GlampingHub. Closer to home in the Pacific Northwest, you’ll find yurts, greenhouses and tree house cabins on the river. Many are situated on the way through or near wine country, presenting the opportunity to wine taste along the way. Some accommodations are bare bones rustic while others definitely put the glam in glamping. 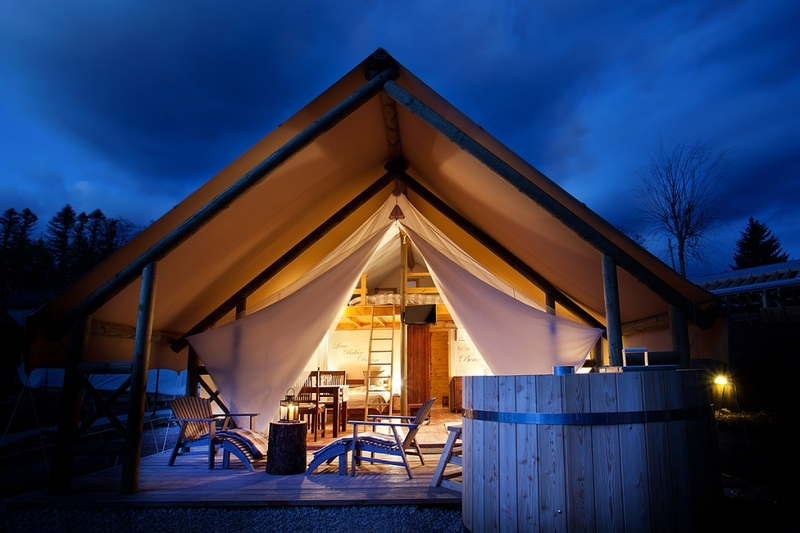 Click here for a full list of glamping in Oregon. 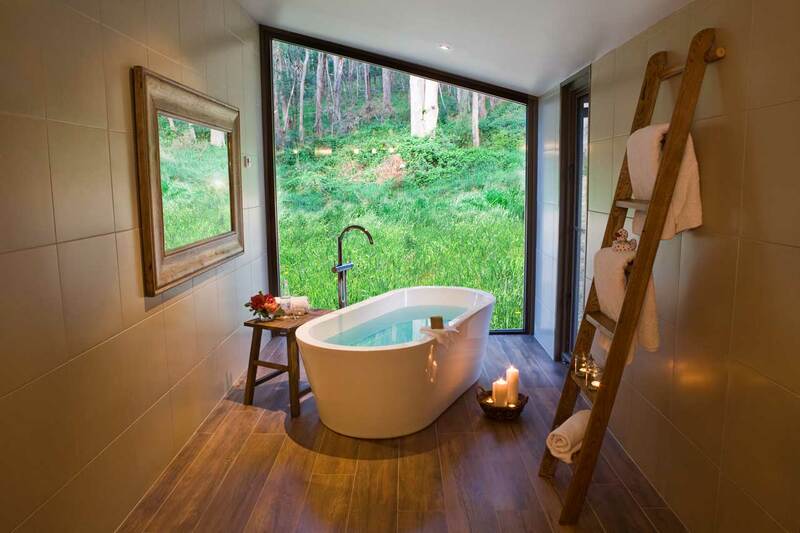 This glamping site provides an amazing view while taking a relaxing soak. Image courtesy of GlampingHub. Still not sure if glamping is for you? How about a free glamping trip to convince you that it’s fun? Natura Wines and Glamping Hub have partnered up and are having a glamping contest. Their grand prizewinner gets free airfare and a 2-night stay in a safari tent in San Diego County. And entering is easy! Just snap a photo of your Natura wine in nature,then post to the Natura Wines Facebook page or on Twitter or Instagram using #SipandGlamp and tagging both @NaturaWines & @GlampingHub. Click here for complete contest rules. Then stay tuned for an upcoming article about how the Winerabblers go glamping! Glamping is the only way I’ll go… I feel no appeal for being physically active all day hiking and no access to running water or a comfy sleep! I’m so excited! I’ll be glamping soon too! Rachel- where are you off to? With 3 small kids, camping is seriously daunting. But this I could get behind! Ali- hauling around kids is hard enough but to leave the camping gear behind, that makes great sense! I love the idea of Glamping making camping more accessible to people who aren’t what we think of as a typical camper. I am a happy camper, and actually enjoy setting up my own tent, but have been doing some glamping things for years, before the term “glamping” was so well known. The pictures of accomadations you shared are striking, I would love to take a bath with that view of nature! Rosie- Thanks! Nice to hear that you’re an experienced glamper before there was a name for it. I too would love to take a bath with that view! I’ve been camping in the rain too many times to say anything against glamping. Thanks, I’ll be looking into some of these sites for this fall. Kelley- I too have camped in the rain one too many times (actually, isn’t once enough?) and am now considering giving away my tent. Happy glamping! I love the variety of glamping spots now available. So many great ones close to home! Marlynn- It’s amazing how many different locations are nearby as well as different types; from tents to yurts to greenhouses! There really is something for everyone. Oh don’t I know it Renée! A comfy bed becomes more and more important with age. It’s definitely a more flexible option too. Forget putting the tent up in the rain! Having something to walk straight into be it a tent, cabin or anything else makes life much more comfortable! We like the idea of a little electricity to power reading light too! Have a look at our cabins and let me know if you are interested in doing some editorial on them in the future. We are pushing glamping in BC and are starting to get some real interest.